If you are concerned about how your complexion looks because of fine lines, pigmented spots, or sun damage, Pura Vida Body & Mind Spa can offer you a skin examination at our Fleming Island, FL office to see if you'll benefit from intense pulsed light therapy (IPL). 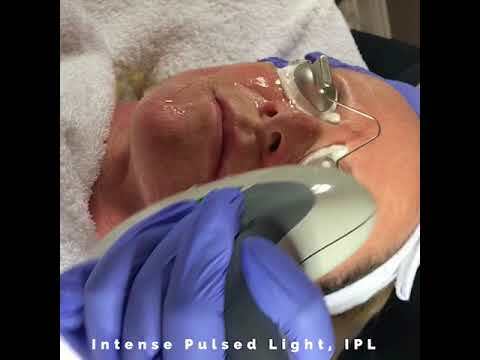 An IPL photofacial is a rejuvenating skin treatment for adult women and men with hyperpigmentation and wrinkle concerns on their face and neck. IPL may not be an invasive procedure, but it can be very effective and produce impressive results. Our trained technicians sends intense wavelengths of light that raise the temperature of the skin just enough to start the natural regeneration process and boost collagen production. In time, you should see a healthier layer with a more even tone and fewer spots. Pura Vida Body & Mind Spa is proud to offer the Limelight IPL system. Known as the "LimeLight Facial," this Cutera technology delivers a noninvasive light treatment that can be customized for various skin types and tones, as well as aging skin conditions. A photofacial works deep within the layers of your skin to correct many complexion problems (especially sun spots and brown lesions) with little or no recovery time. 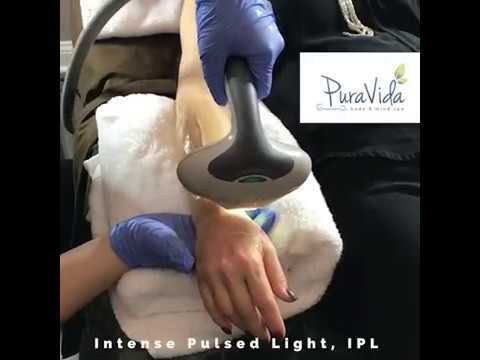 The best candidates for IPL treatments at Pura Vida Body & Mind Spa may have many issues with their skin, including sun damage, rosacea, hyperpigmentation (brown spots), wrinkles, rough texture, large pores, flushing, melasma, age and sun spots, or dilated capillaries. Our team will assess your skin to see if you are a candidate for a photofacial during your private consultation. "I love this place! These ladies really know how to pamper you and help you de-stress! But they are also very knowledgeable consultants, able to evaluate your needs and educate you on what treatments and products would benefit you the most. Amanda has been making improvements to my skin, by getting rid of the red broken capillaries on my nose and cheeks with IPL treatments... it is amazing to see them disappear!! I also asked her to help me find the right products for my middle-aged, sun damaged, starting to wrinkle face and have had wonder results with all of her recommendations! Today I was looking to do something special for myself after a very long stressful work week so (after Kathy lovingly got me a mimosa!!!) Amanda recommended a body scrub and massage with Erica.... what an experience! Erica is a dream and the scrub and massage were heavenly! My skin feels absolutely amazing and I left that room a new woman!I can’t wait to go back!!" "Amanda is amazing! Just had my second IPL treatment and am thrilled with the results! When you go for treatment, ask for Amanda! She is awesome!!!" "Amanda has transform my appearance! After 3 IpL treatment, my brown and red spots have virtually vanished! Amanda, appears to be extremely trained, and very passionate about her practice. Don't hesitate to schedule a conversation. You won't regret it!" "I had a hydrafacial performed by Amanda and it was amazing. Amanda is beyond knowledgeable in all aspects of skin conditions. I have been to several dermatologists and aestheticians regarding my melasma and she was the first who truly knew the condition and how to treat it." "I visited Pura Vida yesterday and saw Amanda. I could not be more pleased with her areas of expertise. She analyzed my skin visually, and then with the Vissa machine. She recommended a series of 3 laser light treatments to help with my overall skin appearance and a fresher renewed look. Kathi at the reception desk is both very professional and friendly. I recommend a visit to this beautiful new spa retreat!" An IPL photofacial is completed inside our Fleming Island, FL office in about 20 – 30 minutes in one of our treatment rooms if performed alone. To start the treatment, the technician will clean and dry the skin to be treated before covering your eyes with special shields. The IPL photofacial is administered with a handheld device that will be passed over the skin, emitting pulses of laser energy. While most patients will feel some discomfort during the IPL photofacial, it is generally tolerable for the fast treatment time. There is no recovery time associated with a photofacial, but you will leave your appointment with your skin a little swollen and pink. This will subside on its own in several hours — it can be concealed with makeup if you want. Pura Vida Body & Mind Spa suggests patients apply an ointment on the treated skin to decrease irritation and speed healing. It also helps to take an anti-inflammatory medication to reduce swelling. Over the next several days, the blemishes that rested under the skin will come to the surface and then begin to flake off. It's important to keep your skin protected from the sun at all times after a photofacial and to not pick at the flaking skin. While you should see some results after the first session, your skin will attain the best results after several IPL photofacial sessions. Our trained technicians recommend approximately 3 – 6 treatments done around once a month at Pura Vida Body & Mind Spa. You probably didn't worry too much about your skin when you were young, but now that environmental damage such as wrinkles, sun spots, and other problems are becoming visible, you now may be interested in procedures that fix your skin. We invite you to learn more about IPL photofacial treatments by calling our Fleming Island, FL office and scheduling a skin assessment. With IPL photofacial treatments at Pura Vida Body & Mind Spa, we can go deep within the layers of skin to help restore a radiant glow and a healthy complexion.